Amy is best known as Dr Jill Weatherill for all 8 series of THE ROYAL on ITV. Television credits include WORLD'S END (BBC), DOCTORS (BBC), THE SLAMMER (BBC), HEARTBEAT (YTV), DALZIEL & PASCOE (BBC), VICTORIA WOOD WITH ALL THE TRIMMINGS (BBC), 30 YEARS TO LIFE (NBC), CASUALTY (BBC), PEOPLE LIKE US (BBC), HAPPINESS (BBC), MY HERO (BBC), HOLBY CITY (BBC), NOAH'S ARK (Whitehall Films) and the BAFTA winning MY BEAUTIFUL SON (Granada). Film credits include KILLING ME SOFTLY (MGM), ALL THE LITTLE ANIMALS (Island Films), UP ON THE ROOF (Granada Films) & JUNGLE BOOK 2 (Columbia Tristar). On stage Amy most recently starred in REHEARSAL FOR MURDER (UK Tour), ADULT SUPERVISION (Park Theatre), Titania/ Hyppolita in A MIDSUMMER NIGHTS DREAM (Royal and Derngate Northampton). Further credits include BLOOD BROTHERS (West End), ROMEO AND JULIET (Buckingham Palace), A DAY IN THE DEATH OF JOE EGG (Nottingham Playhouse), ACCRINGTON PALS (Chichester Festival Theatre), 4 DOGS AND A BONE (Etcetera), ANGELS RAVE ON (Nottingham Playhouse), DONA ROSITA THE SPINSTER (Almeida Theatre) & THE COUNTRY WIFE (Glasgow Citizens Theatre). 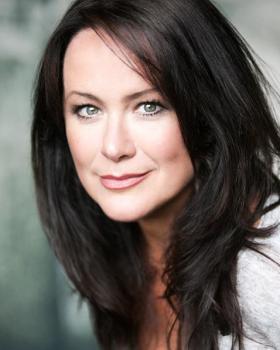 Amy was recently seen as semi regular Lynette in HOLLYOAKS (C4).